They are winning over the neutrals with their unlikely pursuit of the Premier League title. Now Leicester City are winning over young fans off the pitch too - after laying on a special treat for a grieving young boy. 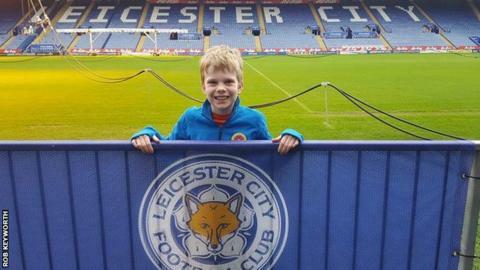 Nine-year-old Charlie Keyworth was given a VIP tour of the King Power stadium after the club was told about how he had lost his mother Sandra to cancer just two days earlier. "All Charlie wanted was to go to the shop and get a mug and a key-ring," said his dad Mike. "He got an awful lot more and it took his mind off other things for a while." Charlie's uncle Rob Keyworth made contact with Leicester to ask if they could "make a bit of a fuss" over him, as Charlie's great uncle Ken Keyworth was a successful player for Leicester in the 1960s. Leicester responded and got the club historian involved, inviting Charlie to the King Power Stadium where he could see some of his great uncle's memorabilia. "Basically with no notice Leicester City rolled out the red carpet for a nine-year-old boy who has just lost his mum," said Rob, 43. "Thank you Leicester. Thank you." Rob said it was a gesture which would "live with Charlie forever". He added: "It is a nice story and Leicester deserve credit. In this day and age where the football club get bashed left, right and centre. "For what was a pretty horrific week, it was something positive at the end of it and nice to remember."